Our Trisomy 18 journey of our beautiful daughter Darian Sadie Randall began, unknowingly to us November 9, 2008, with our positive pregnancy test. We were ecstatic to learn of this new sibling for brothers, 4-year-old Kieran and 2-year-old Joah. We were sent for an early ultrasound at 8 weeks to verify dates, something I had done with my previous 2 pregnancies. This was when I experienced my first flutter of anxiety over this pregnancy. According to the ultrasound, the baby was measuring 4 days smaller than what I calculated. I tried to put this anxiety out of my head, “it was only 4 days”. After seeing the heartbeat at the first ultrasound we told our boys the great news, they were so happy and excited. Along we went with our busy lives until my routine 20-week ultrasound. My husband Jody and I were so excited to see the little one. To ease my previous anxieties, I asked the tech what the due date was showing at this time. She didn’t answer us, evaded the question and left the room. My heart started aching at this moment and hasn’t stopped since. She came back into the room and said there were a couple more things she needed to check. This was all she would say, we sat in silence alone with our thoughts as she finished the exam. We waited 2 grueling days to get the ultrasound results from our family doctor. Our doctor said that everything looked pretty good with the ultrasound, but there was one concern. My heart stopped for a moment. A choroid plexus cyst was found in her brain. A what? Nothing really to be concerned about it’s just a soft marker for a chromosomal abnormality. 1% chance of a problem. OK, so there is a 99% chance our baby will be fine. She was also 6 days behind in her growth, but this is still within normal range. My doctor advised us to book another ultrasound in 1 months’ time; just to be sure the baby is growing appropriately. OK, more waiting. Finally, the month passed; with racing hearts and hope we sat and watched the tech take measurements and pictures of our beautiful active little one. I had to ask the question again, what is the due date showing? After a long pause, she told us the baby was measuring 3 weeks behind. I started shaking and the dark worry set in full force. We made an appointment with our doctor in 2 days. When she entered the room my heart was racing, and I was already on the verge of tears. Some concerning results of my ultrasound: the baby was extremely small, and her umbilical cord was now a 2 vessel cord when it should be a 3 vessel cord. This is another indication of a chromosomal abnormality. She set up an appointment at the maternal-fetal clinic in Calgary, AB. In 3 weeks. These weeks of waiting were some of the darkest of my life, consumed by worry. I researched every moment I could, trying to keep some hope alive. 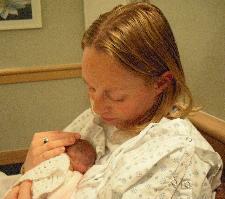 I found stories of families with similar situations that ended happily with a healthy baby. That hope along with love and compassion from friends and family is what got me through that dark time of my life. We still had only told very few family members and friends, not wanting to worry anyone or say it out loud too many times. There was still hope, right? We set off for Calgary a 2 1/2 hour drive, on May 4th, 2009, our hearts were heavy and anxious, but still hopeful. We drove with a sense of anxiety yet relief, questions would be answered today, these were the experts. On top of what the previous ultrasounds had found, our baby was also found to have a cleft lip. Yet some of the other signs of Trisomy 18 were not found, her hands didn’t seem to be clenched, no club feet, no other structural problems. We were given a 5-10% chance of Trisomy 18, he indicated that it was probably more likely a syndrome that would be diagnosed after birth. After much discussion and soul searching between Jody and I, we decided to go ahead with an amnio, we wanted to know what we were facing. I lay as still as a stone on the table and closed my eyes, as the amniotic fluid was taken from my womb. We left the clinic with a huge weight lifted, the worry of a chromosomal problem would be answered. I knew we had made the right decision. We were homeward bound when the contractions started. Frantic, we returned to the hospital, I was set up on a fetal monitor, the contractions were mild, and our Darian was handling them fine. They admitted me for the night. We called our amazing friend Sheryl who watched the boys for us for the next 2 days. The contractions slowed and were getting milder. Suddenly, the next morning they started again; I called the nurse and asked her to put the monitor back on, I just had a feeling something wasn’t right. Jody had just returned from the night before. She handled the first contraction on the monitor without incidence. When the 2nd contraction came and her heart rate plummeted, the chaos began. I was rushed to the OR, put under general anesthesia and prepped for an emergency c-section. May 5th, 2009, our beautiful daughter Darian Sadie Randall was born, she was being loved and watched carefully by her daddy in the NICU. I woke up and was so happily surprised: I had a daughter! They rolled me in to meet her, she was so beautiful, perfect and tiny, weighing 1 pound 9 ounces. My sister and my Mom arrived after a frantic 6-hour drive to meet their niece and granddaughter. We were visited by the genetics team, and a few more indications of T18 were found. So we waited for the FISH results from the amnio. The results came the next day as Jody and I were sitting on either side of her isolette loving, touching, and singing to her. Our worst fears had come in the form of T18. It was a devastating diagnosis. Our world stopped spinning, we sat in disbelief sobbing. Looking at this little person whose life we loved more than our own, knowing we would have to say goodbye to her. Not something any parent can be prepared to face. We were looking into her gorgeous blue eyes, knowing it was only going to be for a very short while. Our next decision was the hardest I hope to ever have to make. We chose to disconnect her support system. Choosing to let her go felt right in our hearts for her, but it was wrenching and tearing our hearts into a million broken pieces. Jody made the trip south to pick up Darian’s big brothers so they could briefly meet and say goodbye to their little sister. Seeing their excited loving faces look at their sister was breath-taking, and excruciating at the same time. Soon after, more of our family arrived to meet our beautiful Darian. We will be eternally grateful to our loving family for being there to support us and meet an angel. Everyone that was going to come was there, it was time. Our sons Kieran and Joah, my mom Sheila, sister Jenn, brother Richard, Jody’s parents Warren and Diana, Auntie Terri, Uncle Barry, and cousin Jason, said their goodbyes to our perfect little angel and left us alone with our sweet baby. Darian survived for just under an hour after the tubes were disconnected. Jody and I sat with her for hours taking turns cuddling, snuggling, singing, crying, and loving. Then we bundled her up in a white blanket, and hat said our heartbreaking goodbyes and blew kisses as the nurse took her away. Darian was with us on earth for 36 hours and 35 minutes, but I know she is still with us; she is still part of our family. I have learned so much from her little soul. I miss having her in my arms, but I truly see her in everything beautiful. We had a beautiful memorial for her on a quaint beach in the Rocky Mountains. I don’t know why Darian was given to us for such a brief time. I believe that everyone is on a path in their life, learning their lessons, and becoming who they are meant to be at the end of their path on this earth. I thank Darian for leading me there, for teaching me who I am supposed to be. We would like to send out a heartfelt thank you to all of our friends and family who supported us during this delicate and difficult time. The staff at Foothills hospital in Calgary were absolutely amazing to all of us there.